This is the same model car used in the film "Doc Hollywood" with Michael J. Fox. Of course this is the hard top version, the one in the film was a convertible. The Porsche was my father's first car. He bought it for $500.00 in 1967. The car has been off the road since around 1974 (when I was born...coincidence, I think not). Oddly enough it was my mother who convinced Dad not to get rid of the car. In the 1980's we hauled it out of barn storage and did some welding work, and then it sat in the corner of the garage. In 1994 I took the engine out of the basement and got it running again, then we put it in the car. Since then the car has been in storage in various places. 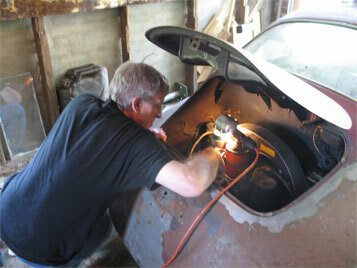 In April of 2007 I moved the car to my workshop. As of May 2007 work has begun. My father and set to a basic goal of just starting his car. As is usual this was easier said than done. One of the most disconcerting developments during the day was when the throttle stuck. Later we found out we had tightened the oil gauge sensor up against the linkage...oops. What was truly frightening was the realization that he and I had last worked on the car 13 years ago. Included here are some photos of him working on the car, the car running, and finally moving under its own power. 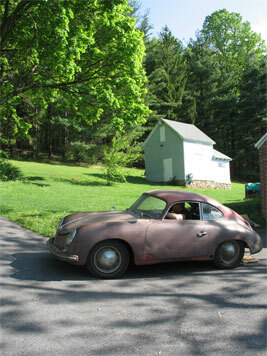 As the dear departed Maestro always said, "Keep the 356 Faith!" Scroll down for more pictures of our work day. My father experiencing the joys of a finicky fuel pump. Heck, we were just happy it made it out of the garage. Rolling under its own power once again!!!!! I grew up with tales of the Porsche and VW's that my father owned. Perhaps this was how the old car bug was passed on to me, or perhaps it was genetics. When my father was in college he had a couple Porsche 356's and a Karmann Ghia at his fraternity, when I was in college I had a line of VW's in front of my apartment building. So, I am thinking that we are genetically inclined to this silliness. Included below are some of the stories that my father told me about the Porsche and the times he had with it from 1967 to 1974. Scroll down to read. The 356 registry. Members gallery, information and more. A website written by a couple traveling the world in their 356 C. Great fun! 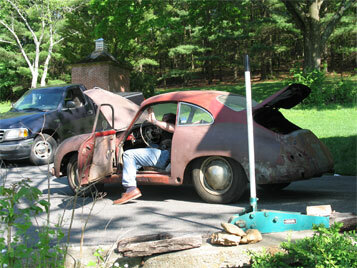 A good site showing the restoration of a 356 C.
Charlie White's page on original 356 literature. 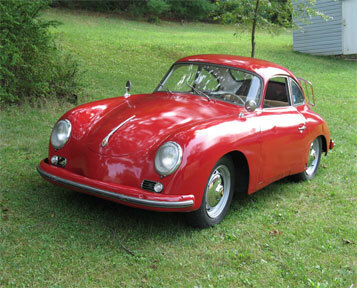 If you want to laugh and learn about Porsche 356's go to The Maestro's website and order one of his books. Or at least read some of the stories linked on his site. 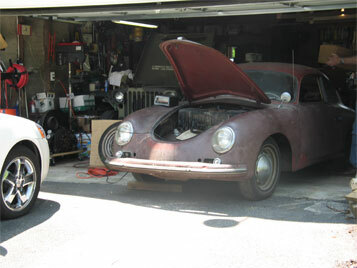 When I got back into VW's a couple years back I began tinkering with my father's 356 as well. 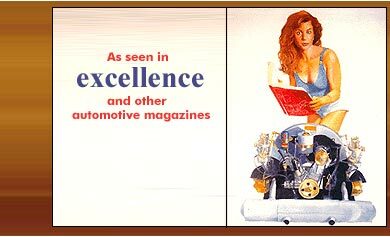 Within a year of reentering VW and Porsche world my favorite VW magazine went under, but worst of all Harry Pellow passed away. I was heartbroken and saddened that we now live in a world without someone with his knowledge and sense of humor. As the Maestro always said," Keep the 356 Faith!"